Is it just me or is this just wrong? My wife's nephew sent me an e-mail telling me he's going to get one of those things for his 2 barrel smoker. His plan is to control and monitor his meat from work via his blackberry. It's a special little fan with LEDs, temperature gauges, and a built in web page server so you can monitor your BBQ remotely. It all just seems so CALIFORNIA. Like Nancy Pelosi's idea of how to BBQ. Does your smoker really need an IP address??? I'm sorry, but I think you have to stand there, in the smoke, monitoring your fire, IN PERSON, preferably while drinking beer, for it to be a real barbecue. 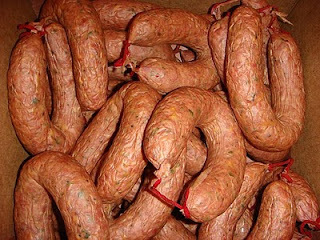 Barbecue is NOT something you are supposed to do by Twitter. At least that's my opinion. What do you think? 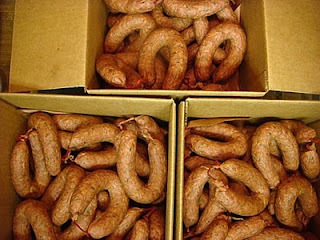 I ran out of Kreuz jalapeno cheese sausage last week so it was just a matter of time before I had to make a sausage run to Lockhart. I headed down Wednesday, in a steady rain, which continued all the way to Lockhart. This was my first time to use the new toll road 130, the Pickle Parkway, named after former congressman Jake Pickle. Man, I love the Pickle Parkway. It's not as funky or scenic as taking the back roads down through Taylor, Elgin, etc, but it drops you off 15 miles north of Lockhart and avoids all the traffic mess on I-35 between Georgetown and San Marcos. I've taken the slow, funky route many times. I've taken the traffic nightmare that is I-35 more than I should have. From now on, it's the Pickle Parkway for me. I think the total toll is about $6 between Georgetown and the 183 cut-off, but it is 70 mph all the way and you practically have the road to yourself. I think that's a bargain. I checked into the Lockhart Best Western, our usual spot, and grabbed a siesta before hitting Black's BBQ for supper. It wasn't very busy but the food was off the chain, as usual. The brisket was extra super smokey and I enjoyed it immensely. I think the lady who served me up gave me a regular link instead of a jalapeno one, but it was still tasty. The ribs were nice, too. 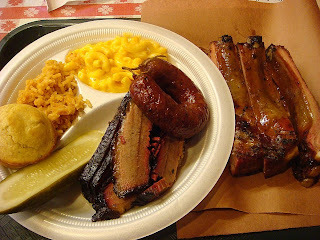 That was the first time I had seen spanish rice on the menu and it was pretty good with BBQ. Black's always has different sides than the standard coleslaw, beans, and tater salad which is a nice feature. 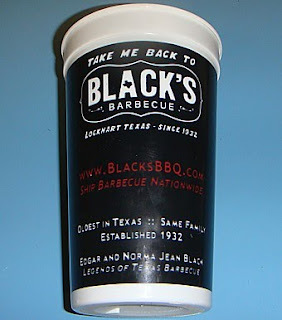 Their iced tea also came with a plastic cup this visit so I came away with a free Black's souvenir as well as a full happy tummy! 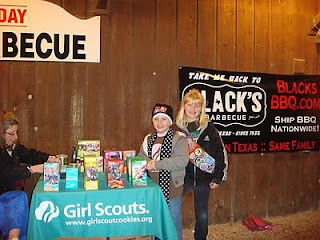 Outside of Black's some brave Girl Scouts had their cookie shop set up in the cold so I took the opportunity to pick up some thin mints. After a fun night in Austin seeing some friends and hearing some blues, I headed down to Luling at 11 the next morning to grab some lunch before starting the trip back. I got there just before the lunch rush and all was as it always is. Awesome. The ribs were of particular note this visit as they had a dynamite sweet bark that had just a hint of crispiness. The inside of the ribs were juicy and moist and full of smoke. The brisket was very tender and smokey and the link was tasty and moist. 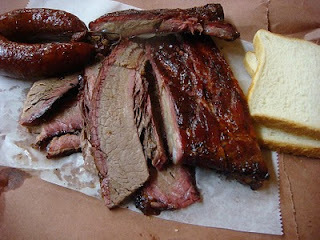 I picked up some extra brisket to bring home and a bag of goodies for Scott and left just before the big lunch rush hit. There were about 20 people in line as I hit the door.